As a five-time winner of the Pacific Sun Best of Marin award for Seafood Restaurant we strive to use only the highest quality ingredients in the preparation of every dish. Only the best extra virgin olive oils, freshly grated Parmesano-Reggiano, De Cecco pasta from Italy, fresh farmers market vegetables or Marzano Italian tomatoes in our sauces. All of our produce is fresh and the seafood is delivered directly from our fisherman to your table. Call to make reservations or drop-in for lunch, dinner or the best happy-hour in Sausalito. Live Dungeness Crab, wild caught gulf prawns, local Petrale Sole, Hawaiian Swordfish and Ahi Tuna are only delivered fresh from our fishermen daily with an emphasis on local, sustainable and ethically sourced seafood whenever possible. Come in for fresh oysters, clams or fresh Maine lobster from our lobster tanks. Let us help you prepare a gourmet home cooked seafood dinner by using our take away option. Want to recieve unique seafood recipes? How was your dining experience? Write to us and let us hear your feedback. Sausalito's weather is driven by our unique location at the end of the Golden Gate Bridge in a series of sheltered valleys near the entrance to San Francisco Bay. Feel like a having a special meal but don't want to sit down for dinner? 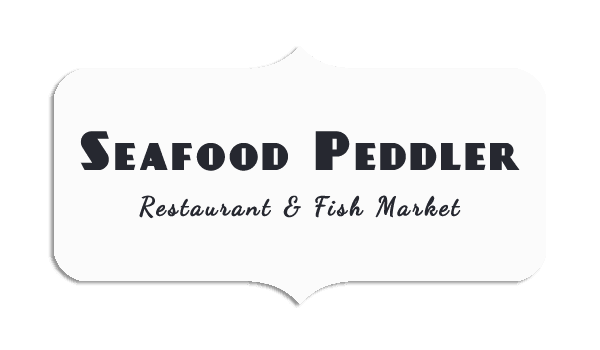 The fish market at the Seafood Peddler offers a diverse catch and carry menu. We provide everything you need to prepare an amazing seafood dinner at home.